Gamil Design was contracted by the City of Raleigh and the Raleigh Convention Center to once again create a centerpiece for a top-tier city festival. We brought back all of our favorite coordinators and performers of Maximus Circus to produce “Maximus America,” which included a wide perspective of American history and the stunt artists to make the stories come to life. The finale kicked off the July 4 fireworks announce by Mayor McFarlane. 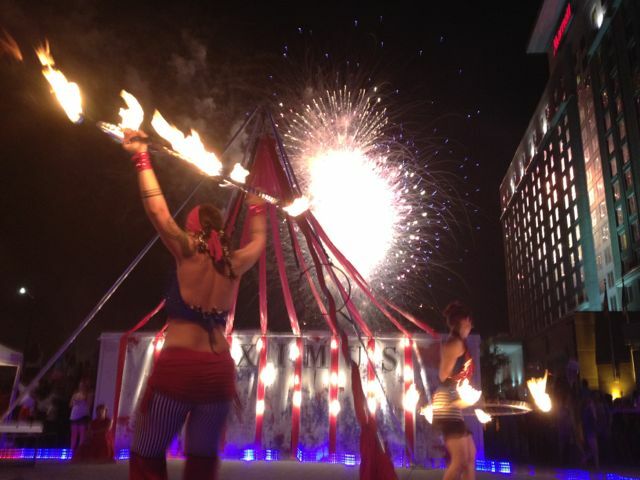 With fire on the ground and in the air, we entertained thousands with local creative talent. Special thanks to Gamil’s Britt Freeman for stage management, and the incredibly organized and positive Kaci and Katie from Acroentertainment for fantastic talent management. It’s a thrill to work with great people – for a product or a circus! This entry was posted in Creative Culture and tagged Circus, Gamil Design, Maximus Circus, Mayor McFarlane, Raleigh, Raleigh Convention Center on July 5, 2012 by aly.